David Weiss lived in an apartment on the ground floor in a neighborhood that was built shortly after World War II during a housing shortage in New York City. The buildings were all two-story red brick and they stretched for miles in every direction. Each two-family building had a small garden that was arranged by its inhabitants and maintained by the work crews hired by the cooperative. Sometimes, a loud siren would sound and the children would run home. At school, the children were trained to get out of their seats and curl up under their desks when a similar warning signal was raised. Nothing ever came of these alarms, so the students came to think of them as no more than amusements. David was the only child of Claire and Samuel Weiss. His father owned a small dry cleaning store in Washington Heights at the northernmost tip of Manhattan and worked long hours. His mother was a housewife. David spent much of his time playing alone with the toy soldiers that his parents had bought for him. Most of the time, after school and on weekends, small sounds could be heard issuing from his room as David animated the soldiers with different voices. He even took the soldiers into the bath with him where the battles continued to rage. The neighbors noticed David’s tendency to withdraw, but said nothing to his parents; they didn’t want to get involved. It was at an Open Day that David’s teacher suggested to Mrs. Weiss that they try bringing a pet into the house. She had read an article in Readers’ Digest that said companion animals could help lonely children overcome their shyness. Samuel Weiss obtained a kitten from the local shelter. It was small and grey and left tiny puddles on the neatly waxed kitchen floor. Claire Weiss did not like cats. After a week, she asked her husband to return it, and shortly thereafter she found fault with its replacement. David would invite a friend home from school to see his new pet only to find it gone. Once, Samuel Weiss, rather thoughtlessly, took David and his cousin to the circus and purchased a small reptile there. His mother was horrified by the slinky green thing and, in a day, it was released into the wild grass in the backyard. One weekend, Samuel Weiss took David to a pet shop not far from where they lived. 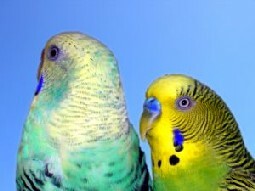 He steered him to the large cages filled with parakeets and asked him which one he liked best. David chose one with a blue chest and greenish wings. The young man helping them had a hard time separating the desperately frightened bird from its kind, but eventually succeeded in placing it in the cage David and his father had selected. They also purchased two perches, a small mirror with a bell attached, a large bag of seed, and a whetting stone on which the bird could sharpen its beak. The young man told them to cover the birdcage with a thin cloth when they went to sleep, that the parakeet would take the darkness created within its cage for night and sleep while they slept. David and the bird—Petey, David named him—became extraordinarily close. As soon as David finished his homework he would go to the cage and talk and pet Petey for hours. Petey would accept affection from David readily, but wouldn’t let adults close to him. He seemed to know that David was different. In time, the bird learned how to open the lock on his cage door. Whenever David entered the room, Petey would open the door and fly to David, landing on his head or shoulder. David would pucker his lips and the bird would kiss him on the mouth. David’s parents were so struck by this that they invited the other grownups from their courtyard to come and see. David and Petey became something of a neighborhood topic of discussion. Saturdays, David always spent his morning watching cartoons on television. The last program of the morning was a show hosted by a famous television cowboy. It was a serial movie about a boy who lived in India, a piano playing cat, and a frog who waved his magic wand and disappeared from view. One Saturday morning, when Claire Weiss was cleaning up the house, she had a particularly hard time getting Petey to go back into his cage. She had dusted the drapes and polished the furniture and floors and Petey, perched on the curtain rod in the living room, wouldn’t come down. Mrs. Weiss kept reaching the end of a broomstick in front of the bird’s chest in hope that he would step on, but whenever she brought it near him he would inch away. Claire Weiss’s face changed from attractive to stoney. She walked to where he was lying on the couch and began hitting him over the head and about the shoulders with the bristles and plastic end of the broom. She kept pummeling him so that all he could do was lift his hands to protect himself. Each time he did this she became more furious and struck him harder. David was six but he knew right from wrong. He pulled away from her and left the house without a word. His mother watched him go. David walked until the buildings were unfamiliar, then he turned around and walked home again. He walked around his block, every once in a while passing his house and staring at his mother’s face looking back at him. She leaned out the window. He stopped and looked at her doubtfully. Running away was more complicated than he’d thought and he couldn’t walk forever. When he got back home he called to Petey, still high on a ledge, and the bird flew down and landed on his outstretched finger. He brought the bird to the cage door and Petey hopped inside. Not long after, while David was outside playing with some neighborhood children, his mother left the front door open to air out the apartment. She was always cleaning, even when the house was spotless. When he came in for lunch, David noticed the empty cage. Mrs. Weiss looked at him with an expression of fear. David looked at the cage, then at his mother. Had she done it on purpose? He felt like crying, but went quietly to his room. When his father came home from work, his mother explained what had happened. To David, the story sounded rehearsed, and he kept eating in silence. His father went on eating too, as if nothing terribly important had happened. It was weeks later, during a rainstorm, that David heard a tapping at the window. It was a parakeet, ruffled as if it was molting and mud-splattered, but a parakeet, striking with its beak and wings on the glass. David didn’t know what to do. He called his father. When David pointed out the bird Mr. Weiss looked and said that it wasn’t Petey, it was a different bird. Sure enough, it was a different parakeet, but David marveled at the coincidence. When David’s mother came in the room, his father pointed at the bird. His mother stiffened. “It’s filthy. Chase it away. I’m not having that thing in my house,” she said. It was at that moment David knew for sure that his mother had purposely left the door open to let Petey fly away. He knew too that she would go on cleaning the house forever, even though it didn’t need it, and that his father didn’t much care. He watched in silence as his parents went to the window and banged and banged on the glass until the parakeet flew away. Jack Galmitz was born in 1951 in New York City, where he attended the public schools and eventually married. His stories have appeared in Enfuse Magazine, Vibe India, Perigee: A Publication for the Arts, Unspoken Dreams, The MAG, and Blank Magazine. He is also the author of three books of haiku-verse: The Effects Of Light, Sky Theatre, and A Simple Circle. He lives with his wife, stepson, and six cats in Elmhurst, New York. Photo courtesy of Albert Lazcano, Barcelona, Spain. Copyright © 2005, 2006, 2007 VerbSap. All Rights Reserved.